TFG Fitness Mix: A Circuit Style, Calisthenics/Body Weight exercises, a complete workout of all muscle groups. Three exercises of one minute intervals, then moving to the next station. TFG Ropes: TRX Core training, combined with Cardio as well as Power exercises, using Hand weights, Step board and other training equipment. TFG Total Fitness: A High Energy, Full on Cardio and Plyometric training. Based on the training of a Professional Boxer, with a combination of Running, Skipping (jump rope) and Calisthenic training. TFG Kickboxing Belt System: Learning Self-Defence, Block & Counter techniques/Combinations from Traditional Lau Gar Kung Fu and Lau Gar Chinese Boxing. A great way to improve your techniques/fighting skills. Starting from White Belt through to Black Belt, with Belt Test after a specified period of training, (similar to Karate Style training). Developing your skills and knowledge in Martial Arts, learning techniques separate to the regular training classes. Skills for life, available for ALL levels. TFG Fighter’s Clinic: Learning/developing fighting skills, techniques and fighting combinations. Breaking down attack/counter moves and footwork. Technical fighting and light sparring in boxing and kickboxing. Head guard, Mouth guard, Shin guard/pads and 16oz boxing gloves needed. TFG Conditioning & Heavy Bag: Designed from a Professional Boxing programme, this is a Hard Hitting training session, combining Calisthenic, Cardio and Plyometric training along with Heavy Bag and Focus Pads work. A 75 minutes Gut Busting session! This is a six weeks course, designed to introduce you to basic punches and kicks. The first part of the course works on techniques and stretching, with some light exercises. 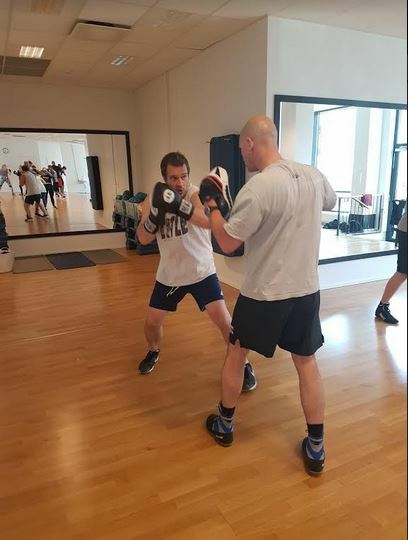 The second part of the course will then develop into a more Fitness Boxing training program and putting combinations together and a great introduction to the next level of training. 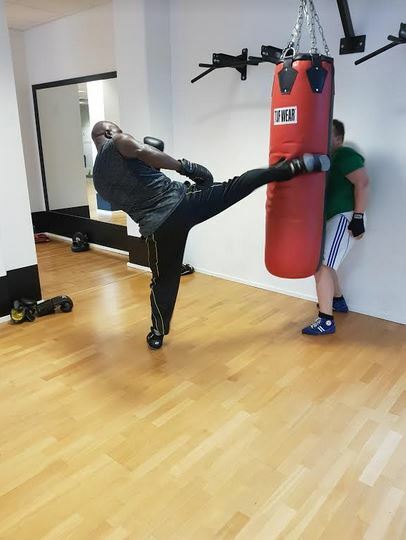 I have been training at Total Fitness for years, developing kickboxing techniques and condition in tough workout sessions – and enjoyed a lot at the same time! Great international atmosphere, very motivated and friendly training partners, and of course a fantastic trainer Mr. Darren Eli pushing us to the next level in training, skills, speed and stamina! Kickboxing is addictive and Darren makes it so much fun which is why I’m always coming back for more. I knew nothing about kickboxing when I first started and since then have passed 2 belt gradings. I hold the greatest amount of respect for Darren who has trained me at TFG in kickboxing combinations I could not even imagine that existed. Bring the right attitude with you and Darren will leave you smiling at the end of the class…he always does. Whether you’re an elite athlete or just a beginner TFG will improve your fitness, technique and mindset in ways only world champion Darren can!